Do you have a case of spring fever? We certainly do! So, pack the lunches, load the cooler and jump in the car to explore these great playgrounds sure to make your kids smile. 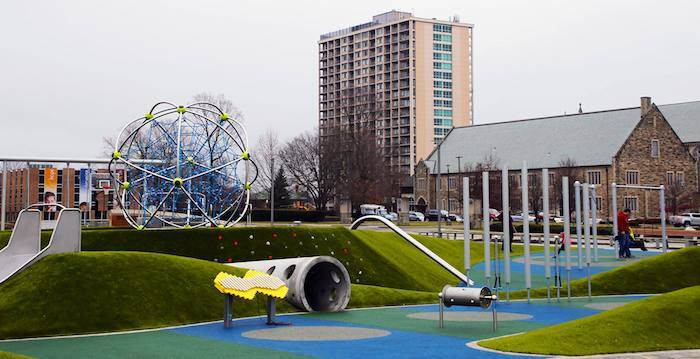 Located on the north end of the Downtown Canal Walk off of West Walnut Street, the nearly one-acre playground boasts a swirling roller-coaster-looking climbing tower, ladders galore, slides for kids big and little, swings, a spinner bowl, twister nets and stepping stones. Many of the playground’s features require climbing, so the Colts Canal PlaySpace is especially fun for older, school-aged kids who like to scale and be adventurous. Little climbers will have a blast making their way up the huge structure to the top of the lookout, which is the only way to get to the entrance of the giant, fast-moving metal tunnel slide. *No official address, but if you put 714 N Senate Ave in your GPS you will get pretty close. Located just six miles north of downtown, Holliday Park is one of the oldest parks in Indianapolis featuring: an outstanding playground area, a Nature Center featuring Habitat Hall, over 3.5 miles of trails, access to The White River, the Holliday Park ruins and more. Highlights: The 20-foot slide tower, spider web climbing apparatus, short walk to the ruins and nature center. Founders Park offers a lot to do in a space that is partially enclosed by a short stone wall, making it easy to keep an eye on all of the kids. Highlights: Spider web net, rock structure for climbing, play structures for both the big and the little kids. Quaker Park got a huge facelift in spring 2017. 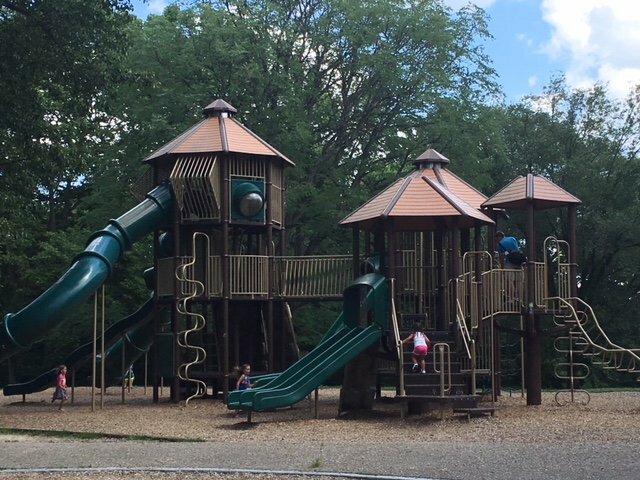 The playground was updated with lots of equipment that is safe and fun for all ages and abilities.Quaker Park is the only park in Westfield that has a splash pad, so it’s a cool place to hit up when it’s hot outside. The splash pad has several misters pumping water that will get you wet, and lots of space to run around. The ground in the playground area is covered with safety turf, which stays nice and cool even when the sun is beating down on it. It’s also super soft to walk on — and land on, if you happen to fall while playing. Highlights: Large rope climbing dome, separate area for babies and toddlers, splash pad within playground. Spanning 25,000 square feet this playground is a child’s dream come true. Right away children will be intrigued by the science fiction inspired appearance of West Commons, and parents will be impressed with the safety features such as the rubber safety surfacing, age-appropriate zoned play and the hill, which creates a natural barrier to slow adventurous little ones. There are opportunities to swing, slide, explore and splash at this playground which was specifically designed to be inclusive and accessible to children of all abilities. After Memorial Day, kids can enjoy the many water features in the splash park. Highlights: Tunnels and coves throughout the playground, two 32-foot tall enclosed towers and the unique climbing walls. This modern and recently overhauled playspace is located in the heart of the city. While it’s equipped with the standard playground fare such as swings and slides, it also offers more innovative features such as synthetic grass and oversized instruments, making this playground fun for children of all ages. The aesthetic will entice visitors, and the well-designed play area will keep them coming back. Highlights: The giant climbing orb, chimes, rock climbing wall and splash pad in the summer. Williams Park is known for its Blast-Off Playground, a large, newly painted wooden play structure. The idea for this themed playground was conceived by the children of Brownsburg Community School Corporation, and their vision was brought to life with the assistance of more than 2,500 volunteers who worked to assemble the structure. Highlights: Large playground and splash pad. In addition to its massive play structures, Roy G. Holland Memorial Park has something everyone to enjoy: Soccer, baseball and softball fields, sand volleyball courts, basketball courts, wooded areas, picnic areas and an active community building perfect for special occasions. Just walk the loop trail to catch the action or to meet up with friends and neighbors out on a beautiful day. Highlights: Huge toddler zone, fields, modern playground with cushioned flooring. Located on the city’s south side, City Center Park boasts a playground and splash pad with brightly colored benches that dot the landscape and overlook the play areas zoned for different ages. The equipment offers different entry points for children of different abilities. Four types of swings and multiple slides are sure to keep kids busy. Highlights: The music station, tandem swings, rock wall and little free library.